Princess Evie is crazy about her ponies. But Evie’s ponies aren’t like any other ponies – oh no! Her ponies are magic ponies, and whenever Evie rides them, she finds herself in faraway, magical lands! 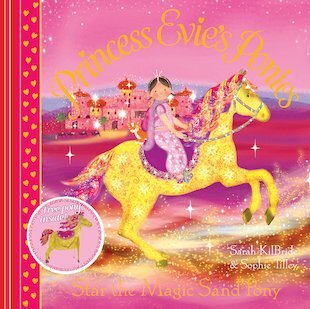 Now Evie and Sparkles the kitten are whisked away on the back of Star the Magic Sand Pony – whirled into to a desert world of heat and magic, where a kasbah castle is the doorway to another fantastical adventure! Gallop into excitement with Evie, Sparkles and Star the Sand Pony in this enchantingly colourful picture book, which includes a free press-out pony.